HÀ NỘI — It is by riding a bicycle that you learn the contours of a country best, since you have to sweat up the hills and coast down them, American author Ernest Hemingway once said. There is another American who has taken this advice and used two wheels to get a comprehensive understanding of Việt Nam’s nature, culture and people. 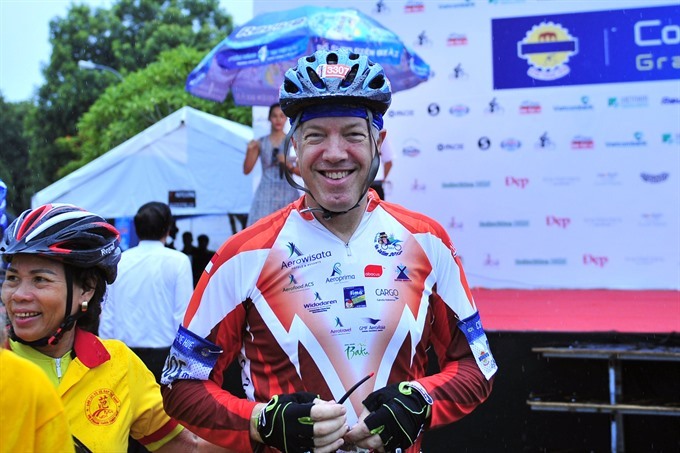 He is Ted Osius, a former US Ambassador to Việt Nam, who just finished a cycling adventure of 138km in the country’s most poetic city of Huế. Accepting the invitation of Nguyễn Trung Trực, a brother-in-law of Việt Nam’s legendary music composer Trịnh Công Sơn, Ted spent late August participating in Coupe de Hue, a sport cycling event. “Trực is my friend, and he knows I love the beautiful, historic city of Huế. The ride was spectacular, and a lot of fun. My family joined me for the event, and we all enjoyed fine food and the warm hospitality of the people of the city,” Osius said. It wasn’t his first long-distance ride in Việt Nam. Before Tết (Vietnamese Lunar New Year holiday) in 2016, he covered 840km on a tour across Việt Nam. During his tenure from 2014 to 2017, Osius rode to many localities around the country, from the northern mountainous province of Hà Giang and the Red River Delta province of Ninh Bình to the central provinces of Quảng Bình and Quảng Trị and the coastal city of Đà Nẵng. As his cycling photographs when viral on the internet, Osius became the best-recognised US ambassador to most Vietnamese people, especially youngsters. His dedication and friendliness have been appreciated. In late July, Osius became the first US Ambassador to receive the Order of Friendship from the Vietnamese Government. “I was deeply moved and consider the Huân chương Hữu nghị (Order of Friendship) the honour of a lifetime. When he presented it to me, Deputy Foreign Minister Lê Hoài Trung read a citation that described not only the major accomplishments during my tenure as ambassador, but also my efforts to show respect to Việt Nam’s people, language, history and culture. That was especially meaningful,” he said. After the end of his tenure as ambassador, Osius and his family decided to live in HCM City, the country’s economic hub, 1,800km away from the classic city of Hà Nội. “We chose to live in Sài Gòn [former name of HCM City] because I received an offer to work as Vice President of Fulbright University, which is located in HCM City. Also, it’s customary for an outgoing ambassador to stay out of the way of a new ambassador, so living 1,800 kilometres from Hà Nội seemed like far enough that we’d be out of the way,” he lightly joked. Quitting the US foreign service, Osius chose to lean into the education field, starting first with Fulbright University, “the first independent, American-style, not-for-profit university in Việt Nam” as he described it. He now chairs the Education Committee of the American Chamber of Commerce (AmCham) in Việt Nam and plays an active role in its Board of Governors. Whether in diplomacy, business or education, Osius sees many opportunities to deepen ties between the US and Việt Nam. Deepening educational and business ties, therefore, is the most effective way to ensure a long-lasting partnership between the two countries. “Our committee has chosen three areas of focus: innovation in education; helping prepare Việt Nam’s workforce for future challenges; and student well-being. All committee members are fully committed to facilitating the highest quality contributions from US companies toward the goal of better education for the Vietnamese people. I’m inspired by the dedication of the entire committee membership and AmCham as a whole,” he said. Citing late US Senator John McCain as the symbol for efforts to build diplomacy between Việt Nam and the US, Osius emphasised strong ties between the two nations as a crucial part of his legacy. “And they will last a long, long time,” he stressed. Having lived in Việt Nam for four years, as an Ambassador and now as an expat, Osius said that the country would always be part of his life and important to his family. “We would like to live here for at least another year, and possibly more,” Osius said. Hello, I think your blog might be having browser compatibility issues. When I look at your website in Opera, it looks fine but when opening in Internet Explorer, it has some overlapping. I just wanted to give you a quick heads up! Other then that, terrific blog!